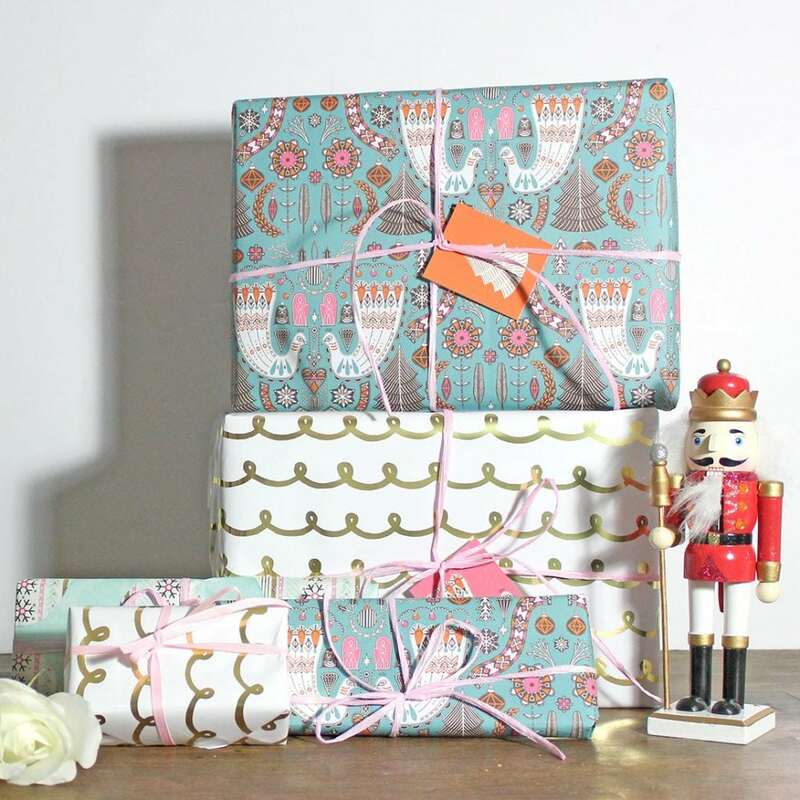 Do you love the look of matching, but not matching gift wrap? It can be so hard to do. You know by now, I am not a designer. I am also not someone with craft-super powers. However, my friends keep telling me how much they love my wrapping paper choices. I just love to find simple ways to get more creative. 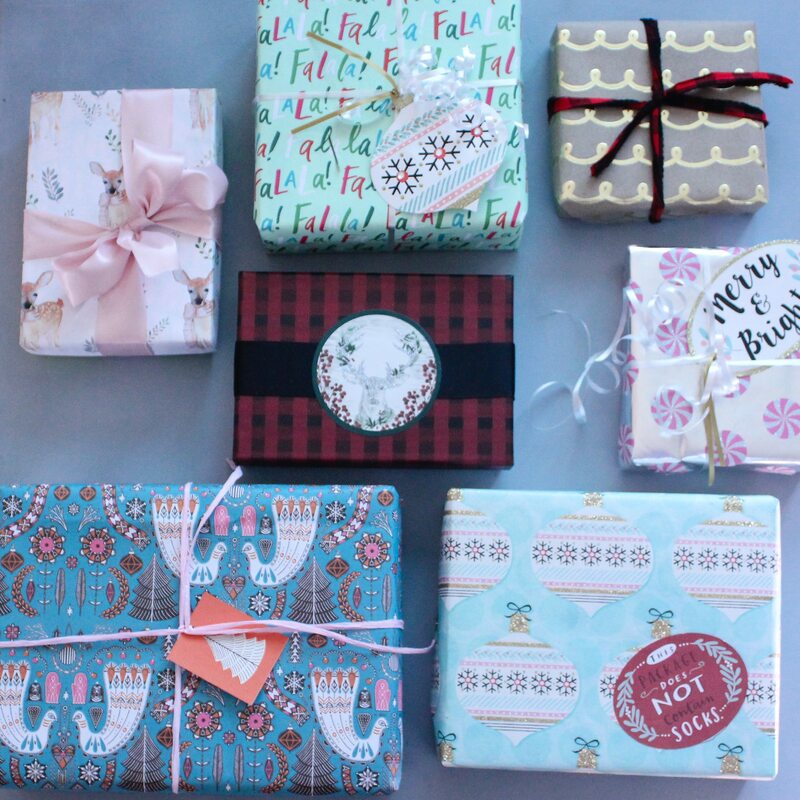 All that said, I can’t wait to share my secrets for creating mix and match wrapping paper which doesn’t loo like you bought it in a combo pack. Now it’s time for the secrets. 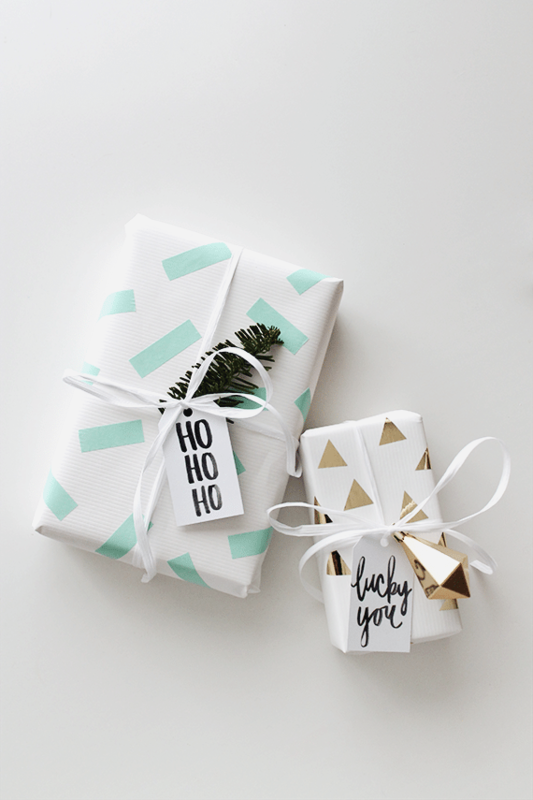 The first way you can accomplish this designer look is to take two completely different wrapping paper styles and tie it together with the similar ribbon. These two styles should be completely different. In my example, we used our beautiful Tinselbox Peacock Christmas wrap from Prism of Starlings in Scotland. It has a bit of a vintage feeling with beautiful illustrations. I also choose the opposite, a modern gold leaf swirl. This print is very modern and trendy. I chose two that didn’t “go” together at all, and yet the combination is super cute. I chose a few other prints that matched one or the other of my originals and kept all the bows similar. Can’t wait to wrap my teacher’s gifts, and show it off to family around the holiday. We tied our packages together with pink ribbon. You can use just two different wraps or pull in others that tie to the colors or patterns. I also had to post this because I am completely obsessed with this watercolor reindeer printable paper. I love how Craftberry Bush, styled this wrap. You can see that on a shelf these wraps might not be an automatic match, but with the right ribbons and bows, it all comes together beautifully. She really chooses three different styles and tied them together with bows. 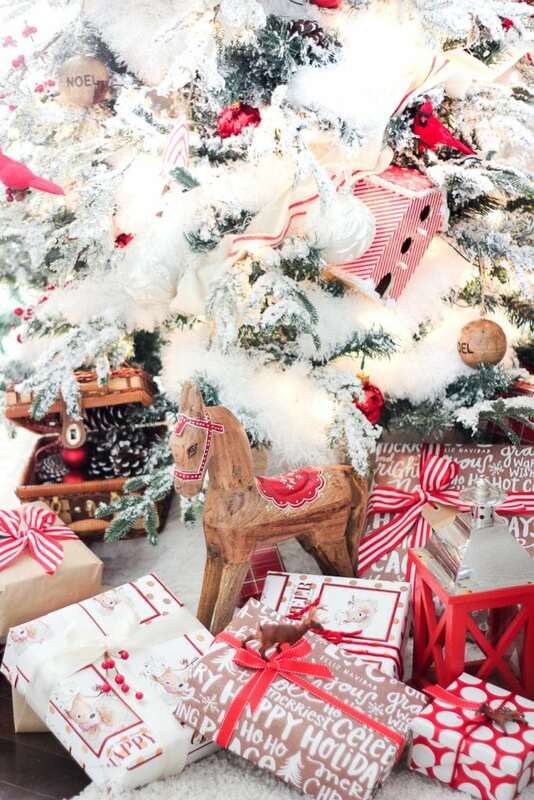 And let’s just be honest, you really want to print this adorable reindeer paper. If my mix-match is too outside the box for you, there is another great way to get that designer feel. You can choose non-matching papers in the same style. This picture shows vintage inspired wrap. This includes reds, neutrals, flowers, chevrons and lots of other patterns. They all have that vintage design. It is so fun because there is so much to look at. 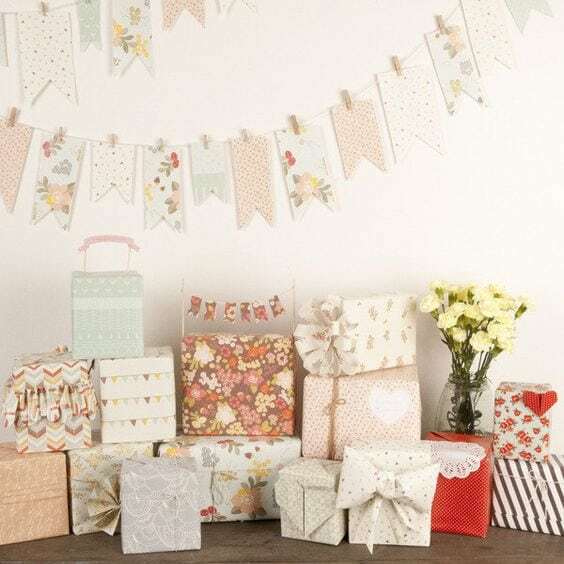 Some other ideas for this strategy are all plaid prints, modern wrap or Swedish inspire wrapping papers. Here is another example of the same style modern paper. In this case, it is modern DIY washi tape paper. Imagine getting lots of different washi tape and doing this project. This design was created by Molly at Almost Makes Perfect. I might try this for birthday wrap. Stay tuned. I made every effort this year to make every single gift different this year. I love this completely mix match wrap idea. I put modern wrap, with traditional ribbon. I paired plaid with gold foil and mixed up all my choices. It is so intentional that it looks purposeful. Under the tree, it reminds me of a company Christmas party after all the gifts arrive. For my project, I chose two papers that definitely didn’t come from the same color-coordinated set. I also prepared a look where nothing matched. 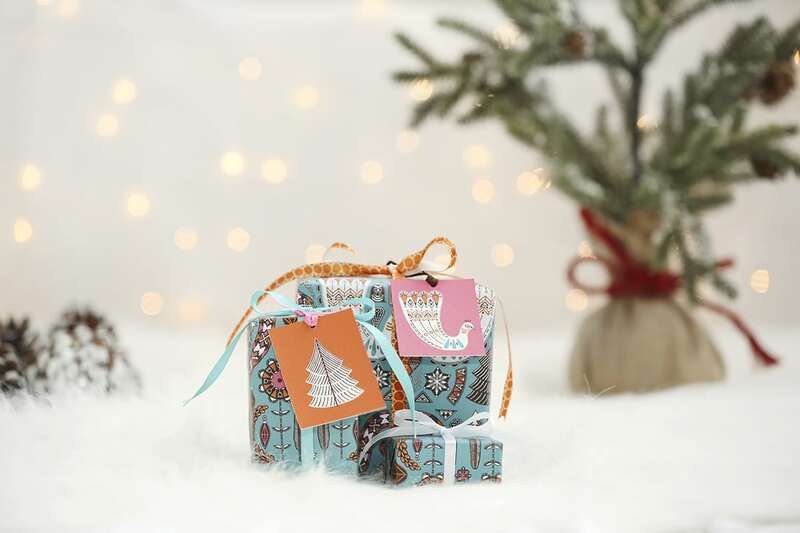 The end result was so fun, so hopefully, you can feel more inspired to design your own combination of Christmas wrap.